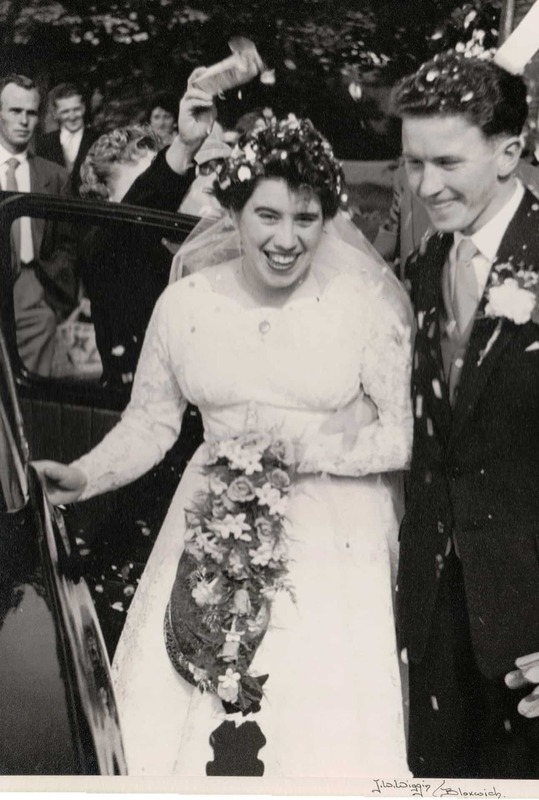 I got married to Frank Tipper, who was from Walsall, at Aldridge Church in September 1958. We re-did our vows recently, we went back to the Church we were married at. I lived in Station Road in Aldridge and then we moved on when we got married. Frank was in the RAF. I couldn’t understand why he wanted to be in the RAF. He wanted one of those flatcaps that they used to wear. He was quite upset that when he joined they changed the hats! He had to wear a cap. I met him, he was a friend of a friend. We’d gone to have our supper with them and we, sort of, palled up with one another then. Funnily enough the next day, going home on the bus, who should be on the bus but Frank! We started chatting to one another and he said ‘can I ask a question?’ and I said ‘yes’. He said, ‘would you mind writing to me while I’m in the Forces?’ I said ‘yes, I’ll write a few letters if you want me to’ and that’s how it all started. I’ve still got a lot of the letters somewhere in my loft. My Brother-in-Law, Roy was the Best Man. My sister was the top bridesmaid and there were two little ones. My sister was in turquoise and they were in lemon and it was flocked. We had our Reception at the Assembly Rooms in Aldridge. My Dad [accidentally] got hold of my dress and I was shouting at him! I just wanted a plain dress, I wanted witchcraft lace, I knew what I wanted. I wanted a scalloped neck and a sleeve. Unfortunately, my cap had a tendency to slip off my head! I still have my dress in my loft. A wonderful marriage we’ve had. We really have. 60 years we’ve had together and it isn’t any different now to what it was. We’ve had a wonderful life. Thank you to ‘Better Understanding of Dementia Sandwell’ (BUDS) for inviting us to meet Margaret at one of their regular groups.